Read on and we’ll explain more…..
It’s clear now that American consumers are now harder to reach than ever before. Not more than 5 years ago you could easily target and reach your prospects one of 3 ways….radio, television, and direct mail. This is not the case anymore because the consumption of these mediums have become so fragmented and disconnected. Television advertisers have to deal with the isolation created by commercial free Tivo, DVR services, and streaming video consumption. Traditional radio advertising no longer works because audiences have moved to Pandora, Spotify, Satellite Radio, and Itunes. Let’s not even talk about direct mail, the cost per household to mail a marketing piece is simply too high. So What’s the Answer? In our opinion……Facebook! Here are the facts, the Pew Internet Research Project found that 71% of all American are now Facebook users. They also found that the average Facebook user spends 40 minutes per day using Facebook! Further studies show that Facebook users are more engaging than any other social media website user. This means they are more likely to respond in some way to your content if properly presented. But what’s the best way to use Facebook to promote your jewelry store? Video posts! Online video consumption has grown a whopping 719% since 2011. Experts believe this is due to quick and easy access to video content with smart devices, users are literally a fingertip away from your advertising messages. Users also long for fresh, stimulating and original video content….that’s where Gem360 comes in to play. We selected a ring that had a story behind it, something original and bold in its appearance. We used the Gem360 service to produce a video of the ring and posted it on Facebook. The jeweler’s logo was watermarked and ghosted in the top left hand corner of the video. 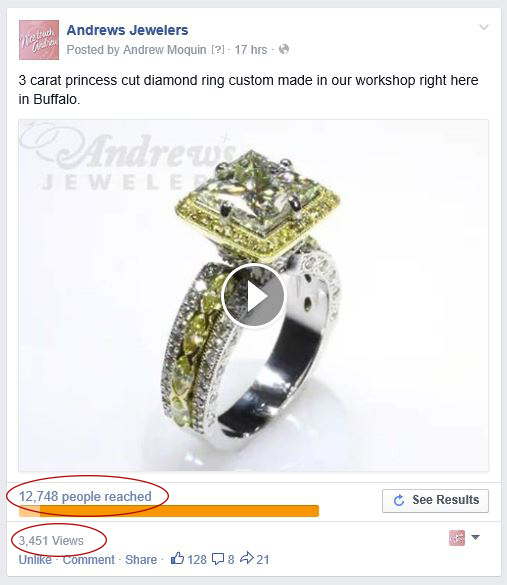 The message that accompanied the video was short and sweet….”3 carat princess cut diamond ring custom made in our workshop right here in Buffalo.” We then boosted the post using the Jeweler’s Facebook advertising account for a mere $100 and got the results posted above. Think about it….what other advertising effort can make while spending $100 and reach the stated results? NONE! 3451 people clicked the video and watched it in its entirety. A steady monthly campaign using product videos could produce overwhelming results across your marketplace. Stand out in the crowd and contact 4Cmedia today, product videos start at only $29 per item. It’s an invaluable service to say the least.